We’d love your help. Let us know what’s wrong with this preview of Ultrasociety by Peter Turchin. To ask other readers questions about Ultrasociety, please sign up. Ultrasociety is an extension of Turchin's thesis, laid out in his earlier War and Peace and War, that warfare is the primary driver of civilization. Why are humans so good at cooperating together in groups? Because warfare between groups is a powerful selector for traits of cooperation, so over time societies that have been good at getting their members to work together within groups have outcompeted less cohesive ones. Or, as Benjamin Franklin said to encourage his fellows struggling to establi Ultrasociety is an extension of Turchin's thesis, laid out in his earlier War and Peace and War, that warfare is the primary driver of civilization. Why are humans so good at cooperating together in groups? Because warfare between groups is a powerful selector for traits of cooperation, so over time societies that have been good at getting their members to work together within groups have outcompeted less cohesive ones. Or, as Benjamin Franklin said to encourage his fellows struggling to establish a new group identity: "We must, indeed, all hang together, or assuredly we shall all hang separately." This inside the tribe/outside the tribe distinction has fascinating implications for many aspects of modern society, in particular understanding how and why many types of violence have declined over time, so if War and Peace and War often seemed like a response to Jared Diamond's Guns, Germs & Steel, Ultrasociety can be seen as a response to Steven Pinker's The Better Angels of Our Nature. The numbers aren't linear, in part because the societies that built those structures did so for different reasons, and also because "Whig history" is an illusion - history does not move in a straight line towards peace and progress. But, even though "man-months" are an infamously inaccurate measure of time cost in the software development world, people-years offer at least one measure of a society's ability to command resources for a specific purpose, and Turchin is correct to point out that by any measure you choose, it's never been easier to coordinate large numbers of people. For that matter, it's never been easier to simply live around large numbers of people, relatively safe from any threats of violence, generating vast amounts of wealth and culture for the enjoyment of your fellow humans. Most theories that try to explain enduring societal cooperation run into the basic stumbling block of the Prisoner's Dilemma - it's hard to come up with robust, intuitive, plausible explanations for how our ancestors were ever convinced that it was in their long-term interests not to be as selfish as possible, since the consequences of misplaced trust can be so catastrophic and the allure of simply stealing your neighbor's resources so strong. The problem gets worse as groups scale, since the incentives for any individual to reap the benefits without contributing get larger, especially as the task gets more difficult or dangerous. This is the basic divide between biologists who believe in kin selection and those who believe in group selection (Turchin is a group selectionist, presenting his specific theory under the name of "cultural multilevel selection"). E. O. Wilson once summed up the logic thusly: "Within a group, selfish individuals always win. But in contests between groups, groups of altruists always beat groups of selfish individuals." How did we get here, and how do we resolve this tension? The standard answer is to say that the incentives to behave selfishly change as situations are repeated or iterated, and Turchin sees the "destructive creation" of war (a riff on Joseph Schumpeter's famous description of capitalism as "creative destruction") as the key to breaking humanity out of the small tribes that other primates remain in. Once you get beyond the "two groups of men shaking spears at each other" phase of conflict, war is an extremely complex undertaking, and in order to get good at war, societies must also get good at peace - working together for a common goal. Successful wars over territory and resources makes victorious tribes larger and stronger, so there's a powerful selection effect that encourages rival groups to copy successful strategies, not only of military techniques but also institutional and bureaucratic forms that maximize power while minimizing waste. Those massive monuments from ages past are only part of the story, as seen by the innumerable records detailing the military histories of ancient civilizations. Even today, history is often told in terms of pivotal battles and campaigns, as they are how nations were created or destroyed. The invention of agriculture is correctly proclaimed as a pivotal moment in human history, but though agriculture is a necessary condition to explain large-scale human cooperation, it's not sufficient on its own. Turchin spends a good deal of time talking about the vast differences in inequality that arose from the agricultural revolution - hunter-gatherers tended to max out their societies at smaller, fairly egalitarian bands whereas ancient agricultural societies developed immensely powerful despotisms. Farmers vs ranchers is a classic divide that remains with us to this day, but the way that a society gathers food has a profound impact on how its social structure operates. Alpha males, in the gorilla sense, limit the ability of tribes to cooperate since they attempt to monopolize the best resources/women, and Turchin has a fascinating, though of course controversial, chapter subtitled "God made men, Sam Colt made them equal" discussing how projectile weapons act as a leveller, allowing societies to contain the damaging effects of rogue alpha males. Besides agriculture, the two other main ingredients required for the growth of states included ritualized religion and property rights, both of which can also be used to encourage despotism. The transition from temporary Big Man to hereditary chief often required religion to overcome egalitarian norms: "Strangely enough, it is easier to become a god-king than merely a king." However, over time gods changed from Greek-type humanized gods and god-kings to impersonal moralizing gods, which allowed for universal religions not based on the heritage of individual tribes. This allowed for religions to serve as unifying forces when appeals to ethnic heritage weren't enough, as in the usage of the term "Christendom" in the context of the Crusades (and, much later, to transition into the modern secular morality of "Christians without Christ"). Property rights were required once groups made the shift from communal hunts to individual plots of land, but the inability of farmers to simply leave when governments became too despotic was yet another tradeoff. The advantages of agriculture for societies as a whole in warfare are simply too great. Of course, it's possible to have many wars without farming being involved at all. Turchin touches on warfare in Jared Diamond's favorite environment of New Guinea, where the constant low-level tribal warfare has manifestly failed to generate any large-scale states. Not all wars are actually successful, and in fact a truly comprehensive historical survey might well conclude that the majority are simply wasteful. In New Guinea this is in large part because of its hostile terrain - the defense-friendly jungle hills make it difficult for one group to annihilate or absorb another, and so there wasn't a lot of the kind of cultural variation that drove the growth of large empires in other parts of the world. Genocide isn't a "good thing", but its absence (indicated the immense variety of languages that New Guinea still has) can mean that humanity is stuck in a negative equilibrium of constant small-scale raids and counter-raids, which over a long-enough time scale could end up being more wasteful than the deadlier but rarer large-scale conquests you see in empire-heavy zones like Central Asia. And that bears on Steven Pinker's thesis in The Better Angels of Our Nature that violence has been on a steady march downwards. Turchin says that the basic Hobbesian state monopoly of violence theory needs some modification, because types of violence like homicide tracked inequality and therefore followed a zigzag path rather than a straight line: high violence in ancestral primate groups, lower in foraging bands, higher again in archaic states, and lower again in modern constitutional democracies. Pinker is a psychologist who tries to ground his theories of social groups in the properties of individual people, but relative peace within societies is an emergent property driven by war between societies, and so Turchin defends multilevel selection as the only logical way to account for this. Pinker's "5 historical forces" that decreased violence - Leviathan, commerce, feminization, cosmopolitanism, and the "escalator of reason" - seem too disparate to offer a truly comprehensive explanation. War, as awful as it is, seems like just the driver of civilization that Turchin was trying to find, selecting for cooperative societies and against distrustful societies. You can read a book about ancient Rome, or about ancient Egypt before that, or about tribal states that were around before both of them, or about the prehistoric hunter-gatherer societies that were around long before any of those. All of those are interesting topics. What this book brings you, is the perspective that comes from looking at all of them, and more besides. Too often we are presented history as if it is a linear march upwards, or a long series of events with no patterns whatsoever. Th You can read a book about ancient Rome, or about ancient Egypt before that, or about tribal states that were around before both of them, or about the prehistoric hunter-gatherer societies that were around long before any of those. All of those are interesting topics. What this book brings you, is the perspective that comes from looking at all of them, and more besides. Too often we are presented history as if it is a linear march upwards, or a long series of events with no patterns whatsoever. This book avoids both of those mistakes, and looks instead at the most fundamental trend of the last several thousand years: the increasing scale of human societies. How is it that I can rely on the actions of others, in a society of millions or hundreds of millions, who I have never met before and will never meet again? Why is it that people in other times and places could not? Why did human society start out egalitarian, then become increasingly despotic, and then reverse itself again? Peter Turchin believes he has the master theory to explain all of this, but is also willing and able to explain competing theories. The key to many good books is not just the questions they answer, but also the questions they ask. Before becoming just the latest author to attempt to answer why the Roman Empire fell, for example, Turchin asks the more fundamental question: why did it rise in the first place? Why are empires possible at all? The vast majority of human societies do not create large-scale states like this. Why did Egypt, and Rome, and Han China, and a few other places create societies orders of magnitude larger than the 150 or so people that are the limit of how many we can know well (Dunbar's number)? There are many places (even today) where efforts to create or maintain a nation-state are unsuccessful. Why and how did we get empires? Once we have some idea of the answer to that, we have a better chance of answering the next question, of why they fell. The situation [of competing theories] is made worse by the division of social science into “tribes” of anthropologists, sociologists, political scientists, and economists. Each discipline tends to emphasize its own set of theories while disagreeing with others (and even among its own adherents). Social scientists are the blind men touching different parts of an elephant and drawing different conclusions about it. -- Peter Turchin, Ultrasociety: How 10,000 Years of War Made Humans the Greatest Cooperators on Earth, Location 567. The thesis of Ultrasociety is simple: over the course of human evolution, we humans have become the most cooperative species on the planet, outpacing our nearest rivals, the more numerous and highly cooperative ants. As Turchin points out, several factors account for this distinction, including two factors that take humans beyond the biological. First, in addition to biological evolution, which is slow and random, humans developed culture, the transmission of information via representation. The transmission of information by culture from generation to generation allows changes in human behavior to occur much more rapidly than any change in the human genome would allow. As a practical matter, the lives of humans, especially in the last 10,000 years (since the advent of agriculture) have changed by orders of magnitude far beyond anything that biological evolution by itself could have allowed. Turchin identifies a second crucial spur to changes in human ways of life, and it may come as a shock to readers. It’s war. Especially in the last 10,000 years, war is—for all its horrors—the most potent source of cultural evolution. War compels change and change occurs through cooperation within groups. As humans developed societies beyond those of hunter-gatherers, as they developed civilization (a society based on cities), war became more organized and pronounced, and increasing competition for survival ensued. The seeming paradox is at the heart of Turchin’s analysis. By the way, Turchin notes that the idea of the "noble savage" leading a bucolic, pastoral life is a fantasy; in fact, hunter-gatherers have shockingly high rates of violent death from warfare and other forms of homicide. Note that Turchin is not a war-monger. He concedes the horror of war and that it entails destruction—often vast destruction. He is not, as some--especially during the period before the First World War--who think war a fine tonic for whatever ails society. Not at all. However, he recognizes war as a competitive environment that spurs intra-group cooperation. Competition between groups and cooperation within groups, whether hunter-gatherer tribes or highly developed and coordinated nation-states are traits that evolutionary theory explain. The controversial (but increasingly accepted) theory of cultural multilevel selection is a key concept for understanding the dynamics involved in these competitions that require so much cooperation. To explain this, Turchin provides a brief history of evolutionary biology and the controversy about whether groups can evolve and undergo a process of natural selection. As recently as the 1970s, with the publication of Richard Dawkins's book, The Selfish Gene (and more recently in some of Steven Pinker’s work), mainstream biology believed that evolution occurred only on the level of individual genomes and not among groups. Turchin points out that there was an early, naïve theory of group selection that did not hold up to scrutiny. However, in work conducted by David Sloan Wilson and colleagues, the theory of multilevel selection became more sophisticated. This theory now provides a persuasive—albeit not universally accepted—theory of how groups compete and evolve. Part of what makes Turchin's work fascinating is that he translates the highly theoretical and mathematically modeled work of evolutionary biology (his native field) into commonplace examples taken from anthropology and history. For instance, he draws upon his academic home at the University of Connecticut, which has a phenomenally successful women's college basketball program (and a successful men's program as well) to frame the problem of cooperation and competition within a group. He uses examples of sports teams as a microcosm of the problem of cooperation and competition. As a member of numerous sports teams and now as a boys varsity basketball coach, this issue has long intrigued me. How does one promote competition within the team to draw out the best individual performances and determine playing time, while requiring those same individuals to coalesce and cooperate unselfishly at the highest level to defeat an opponent? To the extent the team succeeds in cooperating against an opponent, the team will likely win. Maximum success depends on individuals putting aside their selfish interests (glory, pay) for the benefit of the team. Moreover, what applies to something as inconsequential as sports (at least at bill level of high school sports), applies to the level of intergroup competition in something as deadly serious as war. (Of course, this leads one to speculate on the relationship between war and sports, but that's a subject for another time). Turchin explains the dynamics involved and provides some revealing information about how relationships and status among members of a team affect team performance. Studies have shown that wide disparities in pay between professional players correlates with poorer team performance. Those teams with the greatest equality of pay tend to be the most successful. Although Turchin does not mention this directly, one has to wonder how this applies to society as a whole. With an increasing awareness of a growing inequality in American society since the 1970s, one can't help but notice the increasing social and political polarization that occurred during the same period. We have become an increasingly less cooperative polity and society as inequality has grown. Turchin also notes the triumph of individualist philosophies espoused by Ayn Rand, Friedrich Hayek (which is a selective reading of his total work by some proponents), and others who emphasize a highly individualistic and laisse-fair ideology. Turchin quotes the "greed is good" speech by the fictional character Gordon Gecko in the movie Wall Street as an exemplar of the ascendant selfish ideology that began running amok in the 1980s. Turchin makes clear that an undue emphasis on individual accomplishment and selfishness hurts the society as a whole. Turchin can claim to be the founding father of Cliodynamics, a discipline that works to discern patterns in history and prehistory based on the quantification of data through mathematical modeling. Attempts of this sort in the past have been failures. Through the lens of the philosopher R. G. Collingwood (of whom I've been reading a great deal lately), this endeavor doesn’t qualify as history properly understood. For Collingwood, History is the history of thought and not the history of behavior. But Turchin's work and the work of others in Cliodynamics demonstrates the weakness of Collingwood's position. When Collingwood emphasizes history as the history of thought, including the thoughts behind human actions and choices, he limits history to examining the tip of the iceberg. Just as humans are the result of eons of evolution layered one upon another to arrive at our current state, with most of the functions of our bodies running involuntarily and without our conscious knowledge or decision, so with many of the actions of society. Many actions seen together, aggregated over large groups, display behaviors that are not the result of a conscious decision. Often they are the aggregate of individual decisions that reveal a larger pattern. We deal with this every day when considering market "decisions." (But note our personification of markets often leads to poor analysis. The “market” is not a conscious individual; it’s an abstraction of many individual actions aggregated for the convenience of analysis). Turchin analyzes data from the past to better understand the past. (Note: the only source of knowledge is the past!) To me, Cliodynamics is a welcome addition to the field of history. Although I retain my prejudice for history as the history of thought, with an emphasis on political and intellectual decisions, we simply cannot ignore the fact that human beings are both a part of Nature and apart from Nature. To understand the totality of the human past—the highest intellectual endeavor—we need to take advantage of all the tools available. Looking at history through different lenses provided by of social and natural sciences is a resource that we are foolish to ignore. 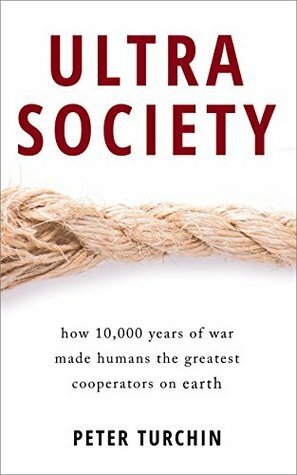 Indeed, in this book, Turchin suggests that perhaps we humans can move another step forward on our evolutionary journey and make war obsolete. The massive improvements in warfare and killing efficiency epitomized by atomic weapons make this more than a utopian dream. It's a practical necessity. The next logical—even necessary—step in cultural evolution must be increased cooperation, or we run the risk of regression to a less cooperative, must more barbaric (in the worst sense of the term) reality. Turchin uses the international space station as an example of the level of cooperation that nations are capable of attaining. He suggests that perhaps economic competition can replace war as a means of spurring cultural innovation without suffering the horrors of war. Paul Krugman, another social scientist inspired by Isaac Asimov’s vision of “psychohistory” outlined in his Foundation books, suggests we need an attack of aliens to foster an economic growth and cooperation, which is much in keeping with Turchin’s direction of thought. I believe that with the imminence of global climate change, we—as a species working through nation-states—will either ratchet-up our levels of peaceful cooperation to combat (by abatement and adaptation) what will become an increasingly alien environment—or we will suffer an increasingly deadly level of social and political conflict. One mark of a successful book is that it leaves you wanting more. You hear yourself saying, “telling me more about this and that.” So it is with this book. The number of issues that it raises, the number of possible areas of explorations it suggests, are too numerous to list completely. But to name just one area of where I’d like to know more: Turchin describes the idea of “cultural evolution” as a scientific theory “based on mathematical models [that] are empirically testable.” Id., Location 330. Moreover, there is a tradition within sociology of social evolution and development theory, as well as theories of history (addressed by Turchin in War and Peace and War). However, I’m wondering about connections with theories of cultural evolution (or change) based on language and other symbolic systems, such as the work of Owen Barfield, Walter Ong, Jean Gebser, William Irwin Thompson and Ralph Abraham, and Clare Graves and Don Beck (an eclectic list, I admit). None of these thinkers, I believe, would necessarily disagree with the biologically based theory of cultural evolution espoused by Turchin, but it would be interesting to determine where they mesh and where they conflict. The ambition of this book is vast: using an (extremely) long-term historical perspective to explain nothing less than how humans are able to cooperate in complex societies. As such, it can be placed alongside other 'recent' books such as Jared Diamond's "Guns, Germ and Steel", Steven Pinker's "The better angels of our nature" and Paul Seabright's "The company of strangers" (for some reason, Seabright is not discussed in the book, which is a pity). The beginning of the books is very promising. The The ambition of this book is vast: using an (extremely) long-term historical perspective to explain nothing less than how humans are able to cooperate in complex societies. As such, it can be placed alongside other 'recent' books such as Jared Diamond's "Guns, Germ and Steel", Steven Pinker's "The better angels of our nature" and Paul Seabright's "The company of strangers" (for some reason, Seabright is not discussed in the book, which is a pity). The beginning of the books is very promising. The book remains very informative and even fun until the end, and contains truckloads full of new (that is, to me) information. However, in the end, it did not live up to my expectations. The reader gets lost in a myriad of (admittedly often original and challenging) theories, anecdotes and data, and it is really difficult to keep track of the general thread of the argument. As has already been pointed out by other reviewers, a lot of what Turchin writes is (clever) speculation rather than well established knowledge, and one feels that other clever speculative theories could be developed that would also be compatible with the sparse data that are available. I see this as an intermediary book in which the author is travelling from the basic ideas set out in Secular Cycles to some, as yet unknown, destination. In this volume, he examines a paradox of human development. On the one hand, human progress can be marked by competition between individuals and groups, whilst on the other, competition is best enhanced when individuals and groups co-operate with each other to achieve a common purpose. Which is it? Of course, the answer is both. However, this is I see this as an intermediary book in which the author is travelling from the basic ideas set out in Secular Cycles to some, as yet unknown, destination. In this volume, he examines a paradox of human development. On the one hand, human progress can be marked by competition between individuals and groups, whilst on the other, competition is best enhanced when individuals and groups co-operate with each other to achieve a common purpose. Which is it? Of course, the answer is both. However, this isn't an interesting answer. The interesting answer is how do we map the times when it is best to compete and those when it is best to co-operate? That is the underlying theme of the book. I don't quite think that the author has reached a final conclusion to this question. Perhaps there isn't one? It is interesting, though, to look at periods in which competition has been intense and periods in which co-operation has been paramount. What I like about this approach is that it has an empirical basis. The author has an approach that develops an hypothesis and then goes out to sieve the available evidence to see if that is true. We are treated to some interesting conclusions. For example, the author develops a model to explain why it is that the scale of collective operations, as developed through the state, has increased over time. We no longer live in villages that are largely cut off from the modern world. Our current society is one characterised by global interdependencies that are largely based upon trust. What intrigues me is whether or not this is reversible? Could the size of society get smaller rather than larger? This is not an easy read. Many of the concepts developed are fairly abstract, even if they are empirically evidenced. The polemic style of writing is not one that appeals to me and it does not make this an easy read. What I did find interesting is that this is a self-published book. It hasn't been edited very well and, at times, comes over as rather home-made. This is a volume for the aficionados rather than a more general readership. The ideas here were generally interesting, but I wonder if war is quite as central to human development as the author says it is. Wouldn't we cooperate with other members of our tribe--in growing food perhaps, in caring for orphans and the sick, in making handcrafted items like pots and baskets--without the necessity of war? I hadn't realized that early human groups would put down upstarts and were thus more egalitarian; I thought it was a gradual progression of complexity and hierarchy. It was The ideas here were generally interesting, but I wonder if war is quite as central to human development as the author says it is. Wouldn't we cooperate with other members of our tribe--in growing food perhaps, in caring for orphans and the sick, in making handcrafted items like pots and baskets--without the necessity of war? A fascinating read on one of my favorite topics, cooperation. Ultra Society hints at an emerging science that looks to bring analytical rigor to historical analysis, but the book takes pains to avoid explaining the rigor in order to avoid losing potential mass appeal. Written in a relatively breezy fashion despite being dense with ideas and theories, Ultra Society feels like it contains the material for 3-4 books, though none of which are contained start to finish. Like the cover art, I was left A fascinating read on one of my favorite topics, cooperation. Ultra Society hints at an emerging science that looks to bring analytical rigor to historical analysis, but the book takes pains to avoid explaining the rigor in order to avoid losing potential mass appeal. Written in a relatively breezy fashion despite being dense with ideas and theories, Ultra Society feels like it contains the material for 3-4 books, though none of which are contained start to finish. Like the cover art, I was left with a feeling that many loose threads were not brought to conclusion. However, I was also left with the impression that the theories are still in their infancy and the analysis is just beginning, so I'm grateful to the author for taking the time to bring these nascent ideas to the public. I expect his methods will yield more robust theories than Jared Diamond or other popular writers, who always left me unsatisfied in identifying principals and underlying drivers. I think Peter Turchin is 2-3 books and some more analysis away from a breakthrough book that stand the test of time. An exciting, thought provoking read whose insights are occasionally dismal but ultimately hopeful. For a brief pop science book, Ultrasociety goes very deep, and it's rich in historical and theoretical insight. Like Guns, Germs, and Steel, it's a good introduction to the history of civilization, and will have plenty for even an expert to chew on. But like most popularizations, Ultrasociety tends to overstate the success and generality of its theories, and to gloss over any aspects of history that fall outside its scope. To his credit, Turchin dismantles a number of popular misconceptions about For a brief pop science book, Ultrasociety goes very deep, and it's rich in historical and theoretical insight. Like Guns, Germs, and Steel, it's a good introduction to the history of civilization, and will have plenty for even an expert to chew on. But like most popularizations, Ultrasociety tends to overstate the success and generality of its theories, and to gloss over any aspects of history that fall outside its scope. To his credit, Turchin dismantles a number of popular misconceptions about cultural evolution. For example, he challenges the (already absurd) idea that complex civilization is the accidental result of selfish genes that dispose us to kindness toward relatives. Rather, he points out that group selection on culture is a more plausible explanation and better supported by the evidence. He also disputes the idea that religion is a memetic virus that does little more than cause violence. The evidence again shows the opposite--more religious cultures tend to show less internal violence and better cooperation and prosperity. He has many insights like this scattered throughout, and they make the book well worth reading. Nevertheless, Ultrasociety falls short of its stated aim, to explain the evolution of enormously complex and large societies like our own. It focuses on the time period between 5,000 BC and 1500 AD, and only occassionally discusses cultural evolution following the advent of gunpowder and the printing press. In fact he admits the gap and promises a more thorough analysis of modern civilization in his next book. But the blind spot here is huge. Between 0 AD and 1500 AD, you saw the collapse of the Roman Empire and arguably no significant decrease of violence in Europe. So his main thesis, that cultural selection tends to create larger and more cooperative civilizations through war, is left without convincing support for the last 2000 years of history. First, because the trend toward larger civilizations is not uniform. Second, because the last 500 years involves powerful forces aside from war. In fact, Turchin admits the shift from violent to nonviolent means of conquest over the last century, but seems to see it as a victory for his view. True, this would seem to be a positive development, but he does little to show how his theory can account for it. The problem is that the scope of his explanation is too vast. Nobody can ever explain in complete detail why and how human civilization evolved. When tackling any question so large, oversimplification is inevitable. Sure, war was essential to the evolution of modern society. He makes an excellent case that you cannot explain the development of large empires and nation-states without war. He is correct that agricultural advances, urbanization, and far-flung trade networks can all happen in the absence of a state, and that a state's main purpose, at least until modern times, has always been the waging of war. But the fact that war has proven essential does not imply that it is sufficient. He discusses the importance of religion, too, but seems to assume that unless it helps a nation wage war it serves no function. He makes the same sort of assumption about every element of culture he discusses: horses, wheels, farming, and even cooperation itself. The ultimate utility of all these innovations is in waging war, he claims. But it does not follow that just because the primary function of states is warfare, that the primary function of all the rest of culture is warfare. Life is more complex than that. There have always been plenty of selective forces aside from war. Finally, Turchin falls into the trap of projecting recent "progress" indefinitely into the future. In an early chapter, he is quick to criticize the progressive view of human history, correctly pointing out that evolution need not lead to improvement. Bafflingly, the rest of his book seems to assume the opposite. States will continue to get larger, encompassing the entire world. Cooperation will become more and more prevalent, he claims. He seconds Pinker's prediction that violence will continue to decrease indefinitely into the future. But modern civilization is very far from sustainable. None of our advances can be counted on to last, not while 90% of our energy comes from nonrenewable resources, not while inequalities continue to rise, and especially not when every major civilization before ours has eventually declined and collapsed due the same kinds of unsustainability. This is a marvelous exploration of history from a new perspective. What is distinctively human about humans is their ability to cooperate. This cooperation has manifestly greatly increased during the past 10,000 years. Instead of hunting and gathering, we are now working together on such projects as the Great Pyramids and the International Space Station. "Ultrasociety" is similar in scope to Steven Pinker's book "The Better Angels of Our Nature"; but instead of asking (as Pinker does) why violen This is a marvelous exploration of history from a new perspective. What is distinctively human about humans is their ability to cooperate. This cooperation has manifestly greatly increased during the past 10,000 years. Instead of hunting and gathering, we are now working together on such projects as the Great Pyramids and the International Space Station. "Ultrasociety" is similar in scope to Steven Pinker's book "The Better Angels of Our Nature"; but instead of asking (as Pinker does) why violence has declined, Turchin asks a different and parallel question --- why has cooperation increased? In the end, these two questions turn out to be related. Groups with greater internal cooperation tend to out-compete groups that do not cooperate as well. Paradoxically, it is war leads to greater cooperation within the group, and ultimately to a decline in violence. I found this book both helpful and convincing. My one criticism is that there's no index. Peter Turchin is one of the pioneers of "cliodynamics," as he calls the application of quantitative methods to history. This book does not have a lot of data, though he does cite a lot of books or studies that have such assessments. For that, you should check out Turchin's book "Secular Cycles" (co-authored with Sergey Nefedov). On a scale of 1 to 10 for how academic this book is, with "1" representing "light summer reading," and "10" representing "totally academic," "Secular Cycles" is a "10." "Ultrasociety," by contrast, is more like a "7". It only has one excursion into mathematical formulas, which comes in the process of explaining the "Price equation." Turchin is patient in explaining the basic concept behind this equation, and if, like me, you've never heard of the "Price equation," then this book is for you. But while there's not a lot of quantitative analysis, there are plenty of new concepts. "Ultrasociety" is a refreshing contrast to Steven Pinker's "The Better Angels of Our Nature." Pinker wants to know why violence has declined (though it is only in the last chapter that he actually tries to answer the question). Turchin, starting from a different perspective, disagrees somewhat with Pinker on the broad scope of this decline. Violence, he thinks, actually got worse for the 5,000 years between the beginnings of agriculture (10,000 years ago) until the development of large-scale states. Turchin also has a very different (and more coherent) explanation of why violence has declined, and dissects Pinker's hodge-podge explanations for why this happened. "The 30 years in America since about 1985 were a giant social experiment. What would happen if ideologies extolling extreme individualism and elevating self-interest as the sole basis on which to organize society were to gain the upper hand? The results are in: a decline of social cooperation at all levels of American society, resulting in a decreased ability to get the job done." Location 904. The author appears to have forgotten the devastation that brought the New Deal and Keynesian Command Economy to a crashing halt in the late-60s through the mid-70s. Cooperation is fine as long as government and bureaucracies are kept out of it because they turn it into an all-you-can-eat buffet for themselves and their friends. As of now, the world needs no more of this government and bureaucratic corruption, though Turchin seems less convinced. A well researched and written book, Ultrasociety seems to have missed the globalization boat now that we are living in the age of Brexit and Mr. Trump. Of course, globalization is not over but it is transforming into something other and one of these transformations is in the form of economic nationalism. This new economy has become necessary because too many of the electorate in OECD countries have been left behind by the exporting of jobs abroad and the importation of cheap foreign labor -- not simply illegals but techies and scientists who will work for less than American graduates. This is the only explanation since only 24% of graduates with a STEM degree are working in their field in the US. Well the author appears all in favor of this, the locals, in the OECD states, have had enough...hence Populism. If readers are in favor of globalization, in its old form, this is a book for you. However, if you believe globalization must begin locally (retraining and employing qualified locals first) then this book will not help enhance your calm. Very good hypothesis for the trajectories of history. The book provides a brief defense of multilevel selection then proceeds to explain how inter-cultural warfare selects for cultures that allow more and more people to cooperate. This is opposed to intra-cultural violence which the author sees as counterproductive. This evolutionary process of inter-cultural competition is, in the authors eyes, the driving force behind the massive increase in cooperation we see over the last 40,000 years. While Very good hypothesis for the trajectories of history. The book provides a brief defense of multilevel selection then proceeds to explain how inter-cultural warfare selects for cultures that allow more and more people to cooperate. This is opposed to intra-cultural violence which the author sees as counterproductive. This evolutionary process of inter-cultural competition is, in the authors eyes, the driving force behind the massive increase in cooperation we see over the last 40,000 years. I think this book make a great case about the role of war as a key factor to mold our society and develop the moral framework that ultimately led to a better life. The only point that bothers me is the author strong left leaning mindset. I think it may impose a bias that push for blindness. His view about the egalitarianism of hunter gather societies, for instance, sound a little bit naive. Many times it is noticeable the oppressed versus oppressed kind of argument. Well argued, comprehensible account of investigations into how war made states and states make war. I read this because I wanted some clues on how our societies are going to co-operate and compete on the really difficult current challenges of exceeding our safe planetary boundaries I, and cope with the challenges of collapse of carrying capacity and mineral resource depletion and fossil fuel supply abandonment. None of those things were directly touched. But this evolution of our cooperative abil Well argued, comprehensible account of investigations into how war made states and states make war. I read this because I wanted some clues on how our societies are going to co-operate and compete on the really difficult current challenges of exceeding our safe planetary boundaries I, and cope with the challenges of collapse of carrying capacity and mineral resource depletion and fossil fuel supply abandonment. None of those things were directly touched. But this evolution of our cooperative abilities , even in conflict , is a good part of the puzzle. Human evolution from the Pleistocene (2 million years - 10 000 BCE) up to present time can best be described, according to Turchin, as a zigzag. The dominance typical of ape groups is inverted into a dominance free, egalitarian polity in hunter-gatherer groups, which is, quite later, inverted into bloody archaic states held by sacrificial god-kings, archaic states that gave way to modern states regulated by egalitarian, tolerant - even benevolent standards in laws, institutions and values. From Human evolution from the Pleistocene (2 million years - 10 000 BCE) up to present time can best be described, according to Turchin, as a zigzag. From the start to the end point in the process, small groups of few dozens individuals facing a 30% death expectancy at the hand of a belligerent group, become ultra societies of more than millions individuals whose like expectancy is about 0,7% (fail states not taken into account). Peter Turchin envision this historical zigzag (and puzzle) through the lens of Cultural Evolution - a trend in biological theory bolstered by such authoritative figures as Luigi Luca Cavalli-Sforza and Jerome Feldman (see chapter 4 for a good overview). Pinker's Better angels of our nature is one setback against which Turchin asserts the superiority of his account : a hodgepodge of reasons (Pinker) given in a inductive way, against a coherent, testable and unified, deductive theory (Turchin). Cooperation is roughly defined as drop in intra-social competition, and a rise in intra-social coordination towards shared goals. Evolution is taken as a modification in a variant's frequency : where a variant (be it genetic or cultural) rise in frequency at the expense of another, we find evolution. Being a mathematician, Turchin shows how calculus of the Price equation sort (p.87) can account for how cooperation rise the cultural group's success in competition against other groups deprived of cooperators. Fortunately, the most part of the book is devoted to historical facts, from recent to distant, shown to support this overall hypothesis : war between groups act as a Destructive creation. Favoring larger, cooperative groups to outcompete others, war is key to how we became more social in large group, to how legitimation of group leadership mutated (first by giving war leader's a prolonged authority in time of peace, given an unrest of alleged foreign threat, second by pulling kings away from the horror of wars). Projected weapons, from rocks, spears, compound bows to horse propelled archers and gun powder, made us equal at different historical turning points, and changed our cultural ways. Of key interest is the debunking of the Dawking-inspired philosophy, preached by CEO and the 1%-ers, offered by Turchin. Time and again in the historical record, open appraisal of egoism and greed led to higher mutual distrust and social dismantlement (chapter 3)). Of key interest also, are the critics aimed against the Rousseau-an view of the noble savage. Violent war through raid, ambushes and the like appear, though archeological records, to have been common currency among natives before European contacts. Ultrasociety is a most-read that offers a view on cooperation and evolutionary transitions that is quit distinct from that of Michael Tomasello (see A Natural History of Human Thinking), Benoît Dubreuil (Human Evolution and the Origins of Hierarchies) Jonathan Haidt (The Righteous Mind: Why Good People are Divided by Politics and Religion), Joshua Greene (Moral Tribes: Emotion, Reason, and the Gap Between Us and Them). For the latter stress how building common grounds, enforcing group's rules and conventions, and collaborating seems to take hold on psycho-biological, automatic, non-conscious means. In a way close to Joseph Henrich (The Secret of Our Success: How Culture Is Driving Human Evolution, Domesticating Our Species, and Making Us Smarter), Turchin take side for the causal power of learning and sharing values per se. One rewarding aspect of Ultrasociety is to give the Axial age view of religion (formulated first by Karl Jasper) a firmer empirical ground than that of structural analysis (Marcel Gauchet's Le désenchantement du monde). Ultrasociety is part of an ambitious research program (Cliodynamics) aimed at (1) turning historical knowledge into a scientific work, forging and testing hypothesis, and at (2) giving policy makers a better angle to prevent violent escalation. While Peter Turchin thinks annoyingly highly of himself and his theories (and gives little detail in the opening chapters), the theory he presents is worth considering and the book became much more enjoyable after the first quarter. Peter Turchin, in Russland geboren und zusammen mit seinem Vater 1977 in die USA exiliert worden, hat Biologie, Mathematik und Anthropologie studiert und modelliert jetzt an der Universität Connecticut die Entwicklung menschlicher Gesellschaften durch Multilevel Selection. Das Buch "Ultrasociety" ist die populärwissenschaftliche Kommunikation seiner Erkenntnisse bisher, und verweist auf eine ganze Leseliste richtiger wissenschaftlicher Dokumentation in den Anhängen. Wir kennen Turchin schon von " Peter Turchin, in Russland geboren und zusammen mit seinem Vater 1977 in die USA exiliert worden, hat Biologie, Mathematik und Anthropologie studiert und modelliert jetzt an der Universität Connecticut die Entwicklung menschlicher Gesellschaften durch Multilevel Selection. Das Buch "Ultrasociety" ist die populärwissenschaftliche Kommunikation seiner Erkenntnisse bisher, und verweist auf eine ganze Leseliste richtiger wissenschaftlicher Dokumentation in den Anhängen. "Ultrasociety" ist dabei quasi das Update zu War and Peace and War und erklärt insbesondere die Rolle des Krieges bei der Entwicklung menschlicher Zusammenarbeit und den Zusammenhang zwischen zivilisatorischer Entwicklung (in "Anzahl der Leute, die zusammenarbeiten müssen, um eine bestimmte gesellschaftliche Leistung oder ein Artefakt einer Zivilisation zu schaffen") und Krieg und Militärgeschichte. Dabei behauptet Turchin, den notwendigen mathematischen Unterbau zu haben, um solche Entwicklungen simulieren und vorhersagen zu können (https://en.wikipedia.org/wiki/Hari_Se...). Not sure how much this book really adds to human thought. I mean, obviously there has been evolution of humans based upon their membership in groups, and anyone claiming otherwise is silly. The author's quibbles with Pinker and Dawkins seem to be just that -- quibbles, nothing at all to contradict them. Quite a bit of whining, "Oh, they don't want to talk about what I think is important!" Nothing, however, really refuting their ideas. Many people gave this book 3 or four stars and I truly believe that's unfair. Turchin's friendly redaction and powerful synthesis are admirable. The book may seem a little bit flat to people that are involved in History, Anthropology or Sociology but for people who's main interest are not social sciences but enjoy reading about those subjects I believe this book will fit very well. He has a strong theory that defends and clearly states that's only one more theory and gives some lights about the Many people gave this book 3 or four stars and I truly believe that's unfair. Turchin's friendly redaction and powerful synthesis are admirable. The book may seem a little bit flat to people that are involved in History, Anthropology or Sociology but for people who's main interest are not social sciences but enjoy reading about those subjects I believe this book will fit very well. Probably a good introduction to cultural evolution through multilevel selection, but if you've read some papers on the topic & perhaps Henrich's book then nothing will be particularly new. Didn't really finished it because of that.